Try out these 4 simple games created using 'Espresso Coding'. Each game has 2 levels to play. Click on a game screen below to play (the game opens in a new window). Also, follow the link below if you want to play the older Espresso Coding games. Santa's Sleigh Dash - Level 1 Well, Santa Claus is having a bad day. One of his 'little helpers' has decided to throw all of the Christmas presents out of the sleigh. 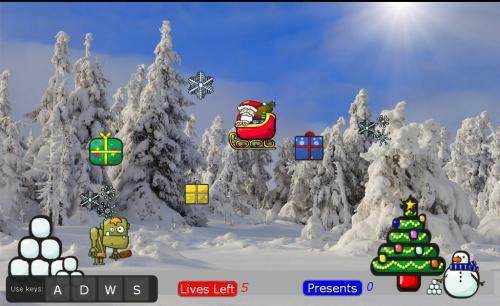 Help Santa collect the presents as they fall to the ground. Watch out though, that pesky 'little helper' is going to jump up and try to knock Santa in his sleigh and if you stray too near to the little fella while he's on the ground all your lives will vanish fast. You have 5 lives in which to collect 30 presents to complete level 1 ! Controls are: W = Up / S = Down / A = Left / D = Right. Santa's Sleigh Dash - Level 2 To make it more difficult if you are hit by the 'little helper' in this level he will knock 5 presents out of the sleigh as well as you losing a life. He will also jump up more frequently now to try and stop you collecting them all (what a bad 'little helper'). On top of that you now must collect 50 presents to complete this stage. 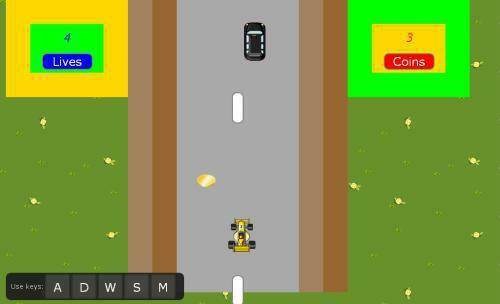 Road Race - Level 1 Control the yellow racing car and collect the coins while avoiding the other car which is slower. You have 5 lives and your goal is to try and collect 20 coins! Watch out though because the other car will swerve randomly as you drive towards it. Controls are: W = Speed Up / S = Slow Down / A = Move Left / D = Move Right / M = Hold Position (cruise). Road Race - Level 2 Level 2 picks up the pace a bit. You still have 5 lives but now you must collect 25 coins to complete the level. 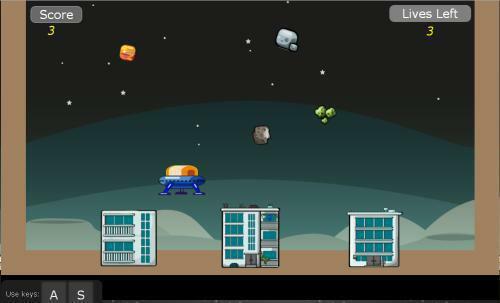 Meteor Shower - Level 1 A deadly meteor shower is passing by and all the buildings are in danger! 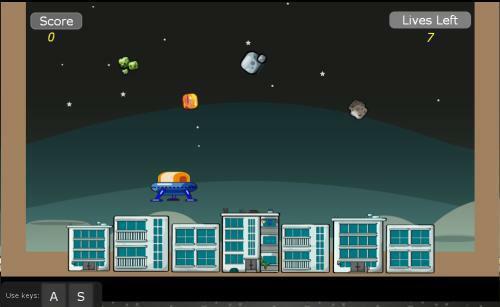 Your mission is to protect the buildings for as long as you can by collecting the meteors as they fall. You lose if all three buildings are hit. If you can collect 30 meteors you have survived the meteor shower! Controls are: A = Move Left / S = Move Right. Meteor Shower - Level 2 More buildings to protect now and the meteors slowly increase in size and change speed. You will lose if all the buildings are hit. If you can collect 40 meteors you have survived the 2nd meteor shower! 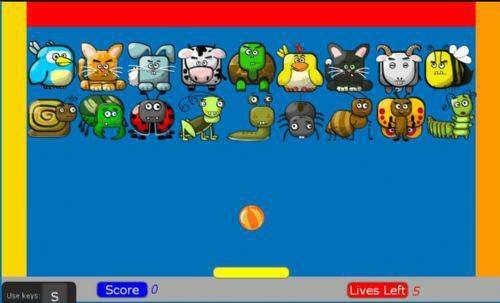 Breakout - Level 1 (Animal Breakout) A traditional 'breakout' game using animals instead of bricks. The ball moves with accurate 'ball physics' and slowly increases in speed. You have 5 lives in which to hit all the animals to complete level 1. Controls are: S = Shoots ball / Move mouse Left and Right to control the yellow paddle. 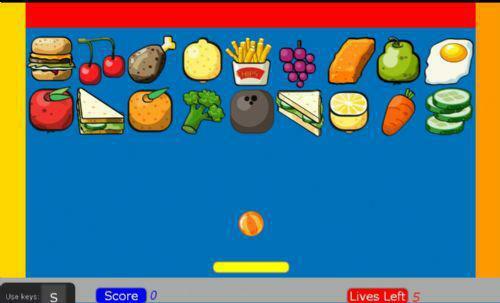 Breakout - Level 2 (Food Breakout) Level 2 replaces animals with food. The ball will speed up a little quicker in this level.